WASHINGTON (Sputnik) - The national security advisor to US President Donald Trump, John Bolton, late Saturday called on the Venezuelan military and on employees of the country's Central Bank to side with the opposition amid the ongoing political crisis. "To the Venezuelan military high command, now is the time to stand on the side of the Venezuelan people. It is your right and responsibility to defend the constitution and democracy for Venezuela! […] Venezuelan Central Bank employees and other bankers should accept [interim] President [Juan] Guaido's amnesty now rather than be held accountable for plundering the country’s wealth", Bolton tweeted. Bolton — a known military hawk appointed by Trump to advise on matters of national security — posted a link to a Bloomberg article claiming that "tensions inside the [Central] bank are brewing" and a link to a video allegedly showing police officers leaving the scene of an anti-governmental rally in the northwestern Venezuelan city of Barquisimeto after refusing to arrest anti-Maduro protesters. On Saturday, both those opposed to and those in support of current President Nicolas Maduro took to the streets amid an escalating political crisis in the country. On January 23, Juan Guaido, speaker for the opposition-led National Assembly, proclaimed himself the nation's interim president. The opposition figure was quickly supported by the United States and a number of other countries. Russia, China, Mexico, Iran, Turkey and several other states have backed Maduro, however, as Venezuela's president. Maduro has repeatedly blamed Washington for attempting a coup in Venezuela. Bolton claimed on Friday that the Trump administration has no plans to militarily invade Venezuela, but suggested that all options remain on the table, adding that there is allegedly overwhelming support among Latin American countries for a transfer of power away from Maduro, the current constitutionally-elected president, to the self-proclaimed interim chief Guaido. Bolton avowed that he and Trump talk several times a day about the situation in Venezuela, and asserted that there are a wide range of economic and political steps that could be taken. In July 2018 the Associated Press news agency reported, citing an unnamed representative of the US administration, that in August 2017, Trump, during a meeting in the Oval Office, asked his aides about the possibility of a military intervention in the country. In particular, Trump reportedly pointed to what he considered past cases of "successful gunboat diplomacy" in the region, such as the invasions of Panama and Grenada in the 1980s, AP reported, citing a US official. According to AP, citing two senior Colombia officials, Trump also raised the issue with then-Colombian President Juan Manuel Santos. After media reports alleging a possible US military intervention emerged, Venezuelan President Nicolas Maduro called on the country's servicemen to be prepared to repulse US aggression. Acting US Secretary of Defense Patrick Shanahan told reporters on Tuesday that he has not discussed with Bolton any military option to solve the current political crisis in Venezuela. 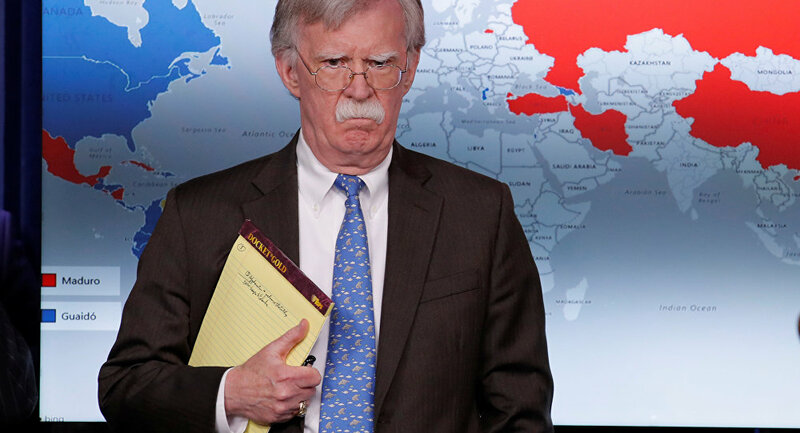 During a press briefing on Monday about new sanctions against Caracas, Bolton was photographed holding a yellow notepad that read: "5,000 troops to Colombia", prompting widespread speculation that senior US security officials are discussing plans to deploy military forces to the Latin American country, which borders Venezuela, to assist a US-plotted military invasion. The Russian Foreign Ministry has repeatedly stressed that it considered any military options with regard to Venezuela unacceptable and warned that they would only further escalate the situation in the country. On Monday, Bolton warned that the US would take action if its diplomatic staff or Guaido are threatened with violence in Venezuela on the same day that Washington seized billions of the country’s oil assets by blocking PDVSA in the US jurisdiction and imposing a ban on business deals with the company. US Treasury Secretary Steven Mnuchin told reporters on Monday that by blocking PDVSA's assets, the Trump administration was taking care of the company "in the interests of the people" of Venezuela, and also protecting the oil market. Maduro has dubbed Guaido a "US puppet", accusing the Trump administration of throwing its weight behind the usurper in the hopes of getting its hands on Venezuela's vast oil reserves, one of the world’s largest.